We are excited to announce that Highway Games will be working with Homepin in their showcase of Thunderbirds Pinball at the Asian Amusement and Attractions Expo (AAA) on the 3-5 of April in Guangzhou, China. We encourage you to come enjoy the final version of the machine, we will be located at Hall 5.2 and booth J320. 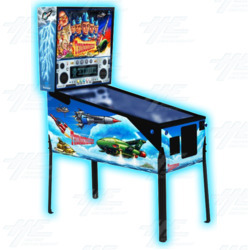 Thunderbirds Pinball, based on the hugely popular UK science-fiction television series, has been lovingly recreated by Homepin. As a pioneer in modern pinball, this machine provides an immersive experience with components such as animated EL panels on the backbox sides and shaker motors as standard. Meanwhile, we have strived to maintain the integrity of the beloved 1960s television program within the machine by including authentic character voices and original music. The AAA China Trade Show is a landmark event, offering more than 1100 internationally acclaimed exhibitors and attracting huge crowds from across the globe to in fact become the largest showcases of games, amusement, and attractions in Asia and second in the world. For more information regarding the event, please visit http://www.aaaexpos.com/index.php?lang=en. Thunderbirds Pinball is suitable to novices and highly experienced players alike, so we welcome everyone to come enjoy this unique experience at a world-class event.